A complete fundamentals of nursing suite written specifically for Diploma of Nursing students in Australia and New Zealand. 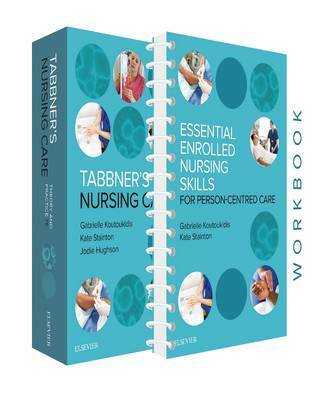 This value pack includes Tabbner's Nursing Care: Theory and Practice, 7e (print and eBook) and Essential Enrolled Nursing Skills for Person-Centred Care and provides a solid foundation of theoretical knowledge and skills for nursing students embarking on an Enrolled Nurse career. Reflecting the current issues and scope of practice for Enrolled Nurses in Australia, this new edition focuses on the delivery of person-centred care, emphasises critical thinking throughout and demonstrates the application of the decision-making framework across multiple scenarios. The workbook is an indispensable tool that will assist students in mastering the clinical skills required to deliver the highest-quality care. Specifically developed to support Tabbner's Nursing Care: Theory and Practice, 7e, the workbook features the essential skills that form part of the assessment for Diploma of Nursing students. Based on evidence-based practice, each skill features a step-by-step approach and rationale to help understanding of how and why a skill is performed.